Starting from Apr 1st 2018, EIT Series have been discontinued. As a possible substitute, please check out the OM-ES-020 or OM-ES-500 for details. The 3rd Generation OMEGA™ iServer3G connects any Serial Device (RS232, RS485) to an Ethernet network or the Internet in minutes, including Serial Modbus to Modbus TCP/IP over Ethernet. The iServer3G can send notifications by email, and has SNMP for remote management. Omega offers custom firmware and private-labeling for OEMs. The award-winning iServer is still the simplest, easiest, most economical way to put anything on the network, without writing a single line of code. The iServer is built on one of the fastest, highly featured microprocessor found in any device of this kind. Getting started with the iServer is very simple and easy because it can take a dynamically assigned IP address from a DHCP server on your network. This DHCP client capability is a valuable and unique feature of the iServer that makes it extremely easy and simple to start using this device on almost any Ethernet network. The iServer connects to an Ethernet Network with a standard RJ45 connector. Serial devices connect to the iServer with a standard DB9 connector. The iServer can be used to make an existing Serial device a "node" on an Ethernet network with a unique IP address that's accessible from any authorized computer on the LAN, WAN, or Internet. The iServer can instead be used to create a virtual tunnel on an Ethernet/Internet network simulating a local point-to-point serial connection between a serial device and a PC. This replaces dedicated point-to-point wiring limited to 50 feet on an RS232 connection. The iServer packages the Serial data in standard TCP/IP packets that can travel anywhere on the Ethernet LAN or over the Internet. The iServer is compatible with almost any device with a Serial interface such as: time clocks, security alarms, card-key access controllers, telecommunications equipment, vending machines, bar code readers, electric power meters, UPS systems, test & measurement instrumentation, PLC's, serial printers, cash registers, and many more. The iServer is compatible with wireless Ethernet. 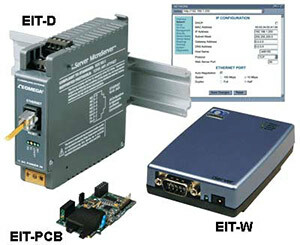 In settings where wires of any kind are not possible, the EIT can be connected to a Wireless Ethernet Access Point enabling simple, economical wireless connectivity of Serial Devices. With the iServer: A facilities manager can monitor electric power usage over the LAN from a desk anywhere in the facility, or from anywhere on the Internet with the proper passwords and authorization. A payroll clerk can download data from time clocks to a PC anywhere on a local area network, or anywhere in the world. A manufacturing technician can use a handheld computer with Wireless Ethernet connectivity to change settings on a process controller. The wall-mount MicroServer model EIT-W for most commercial and IT applications, comes complete with full documentation, firmware, and AC universal power adapter. For industrial applications, Omega offers the EIT-D, in polycarbonate enclosures that mounts on a DIN rail. For OEMs, Omega offers custom labeling as well as customized application specific firmware and design engineering. Omega iServer products are designed and manufactured in Santa Ana, California. Omega provides generous technical support. Input: 5 Vdc @ 200 mA max. 참고: Volume discounts are available.